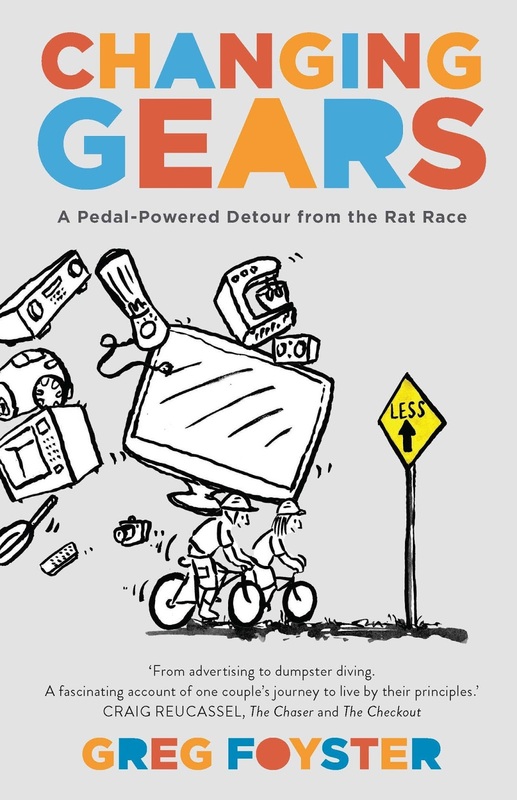 I'd LOVE to be the recipient of the book, Changing Gears. My email address is jimmiepatrum@gmail.com. IF the giveaway is open to non Australian readers---I would love to be inspired by their journey and the people they met along the way. This book sounds awesome. I would love to win it because I am trying not to buy many books. I love to read about people living frugal, simple lives. I LOVE your blog and always look forward to reading it. Hi Rhonda, I'd love to get my hands on a copy of this book - I've followed their journey on their "Simple Lives" blog since they headed off from Melbourne and I've been waiting ever since for the book to be released. Would be a great read. - Michael. I'd love to win a copy. Following their blog since they visited you has been extremely fascinating, and has helped me consolidate and go further with all the efforts we have made in our house to live simply. I'd love to read it. My email is sara.rischin@hotmail.com. At any rate I'll get along to see them in Canberra! I would love a copy of Greg and Sophies book. I have recently heard about their journey and have been intrigued, of the concept of the physical journey and the metaphorical one. I believe he met quite a number of fascinating people as well. They are great ambassadors for a simple life and custodianship of the planet. I'm always interested in anyone who is making a change and can do it with a sense of humor and share it with the rest of us. Thanks for the opportunity to win the book. Wonder if it will be offered as an E-read? Either way sounds good to me! I'd love a copy of this book- I find that I need fairly regular inspiration in this lifestyle, it confirms why I do what I do. Hi Rhonda, I don't know if I'm eligible as I'm in the UK but I would love to win a copy of the book. I enjoy reading about other people's journey to a simple life. It might also inspire me to get on my bike again although it's a bit hilly round here for senior cyclists. Also it would interest me to read about Australia - the Eastern part anyway, somewhere I would love to visit. I look forward to reading their blog in the future. Like a previous commentator, I would love to win the book, if open to people outside Australia. Always interested to read about anyone living a frugal simple life. I have been waiting for this book to come out and am excited it has arrived! I read through their entire blog (a link through your site) and was amazed and inspired! Like Greg, I come from an advertising background and know how empty it can make you feel. I left it after only 12 months and and have never looked back. I'd love the book to inspire my husband. He used to bike, even raced occassionally, and we always intended to buy me a bike when we could afford it. Didn't happen, and now we're nearing retirement, I think it would be a great way to get around - imagine the savings! I jokingly told my husband, an avid cyclist, that we should forget the caravan and cycle around Australia. I never thought that something like that was really possible but perhaps after reading this book we might find the courage to follow our wildest dreams! Only last night I was reading peoples' stories about living simply from "simply institutes' and greg wrote an article and sophie wrote her idea of a simple live and talked about their bike ride and I have also read some of their blog. I know I would enjoy reading the book and would like to share it amongst interested like minded people. Will be home on the weekend after being in the US/Canada for six weeks. I would love to have a read! I am so interested to learn about how other people have transitioned to a more simple lifestyle...my email is inspiredgrowth(at)gmail(dot)com Thanks! Thanks Rhonda! I'm very flattered by all these comments. I hope whoever ends up with the book enjoys it - we had a lot of fun on the journey, and hopefully that comes through in the text. Travelling by bike can be a hard slog at first, but then it becomes a great joy. I highly recommend cycle touring, even if you're not very fit - we weren't! PS: Unfortunately, the way the publishing industry works is that if a book doesn’t sell copies in the first couple of weeks it gets relegated to a dingy corner of the store (somewhere between the Obscure History section and the rickety table covered in remaindered Sudoku puzzles), so if you do plan on buying it, please pick up a copy soonish! I think sometimes many of us would like to ride away from modern life and some of the pressures that it can bring if we are living in a way that is much more complicated that we'd like it to be. Simplicity for most of us is probably not a bike ride around Australia but I would love to read the story of these two adventurers who have actually done it! I'm pretty sure that those quiet moments on the road would've led to some contemplative and inspiring thoughts! It was really lovely to have Greg & Sophie stay with us overnight, whilst on their exciting journey, thanks you for the introduction. They were most pleasant & interesting company. It's ironic that you posted this now as I have already ordered Greg's book & it's due to arrive tomorrow. I would love to win a copy... I'm a mum of two young boys living in the world that has pointed it's marketing campaigns with us directly in their firing line... and I am feeling like the only one that can see it. My friends all think I'm made to want a simpler existence. It will be great to read another couples story about how they are getting there too. This sounds like a fabulous book. I really love reading about people who have inspirational stories to tell. Hello Rhonda, if the givaway is open to us living elsewhere in the world l would love to join! My husband and l really need all the inspiration we can get on our journey towards a simpler life. Pam. If this book is half as inspiring as your 'Down-to-Earth' book then it is a must read and I would love to read it! Thanks for the opportunity to improve our lifestyle. How wonderful that there is another book about simple living. It reinforces for me the fact that there are more people wanting it, or searching for it, and that we are not alone. I'd love to win a copy of the book, to add to my reference library (that's what I call it, anyway). With your book, Rhonda, and this one, I think I can keep on the path. Hi Rhonda, I don't know if you will post to the UK but just in case :) I would love to read the book because last autumn I was in a dark and bad place. One afternoon I took off and walked and walked and walked. I have no idea how far I went but I was out for about 8 hours. For me it was cathartic and gave me a chance to try and unmuddle everything in my head. For my family it was terrible. There were police looking for me, I was officially an at risk missing person. I had no idea of the upset, chaos and cost I caused because frankly I wasn't well. That walk changed my life I was determined to get back on track and never risk losing my family again. I decided it was time to look at how we lived and how it was affecting our lives. Hence our journey towards less stuff and more life. Rhonda, I would love a copy of this book. We are working on simplifying and getting rid of things we don't want or need. It is quite a process with 4 children! Great giveaway! We are bikers in this family, and that's why I'd like to win a book. My husband, especially, would love to do a trip like this. this sounds like a wonderful book. I love to read about people who completely change their lives. It is also a great way to read about new ways to live more simple. Reading about other countries is also something I love to do. Living in The Netherlands, I don't know a lot about Australia, apart from the things I read on the blogs I follow. These are my favorite types of books to read... inspiration, adventure, and simple living all rolled in to one. I'd like to learn new ways to slow down and do things myself. I'm in the U.S.A., so just choose someone else if you'd rather not ship internationally. I'm looking forward to reading it even if I don't win the draw. Will it be available in the U.S.A.? I'm not sure, Gypsie Quilter. You can drop Greg an email and ask. His email details are on his blog. Forgot to add that. Thanks. I'd love to win the book Rhonda as we are slowly Changing Gears here as my Husband's retirement is just around the corner! How inspirational does Greg sound! Thank yoio for the opportunity. I'm hoping to catch Greg when he's down this way! I would love to win a copy of "Changing Lives", Rhonda. Several months ago my son lost everything in a house fire, escaping with his life in just seconds. It has profoundly affected how he views the world and how he now should live. I would love to be able to pass it on to him (after first taking a peep myself! ), as I know he would love it. Num Num Num, finger my bum. I'd love to win this book as I know I'd relate to it and have a good laugh at the same time. Not only do I fully embrace simple living, but I did a 1,200 km bike ride last year. I'd understand the difficulties and challenges Greg and Soph faced, which would make this a satisfying and enjoyable read. Sounds like a good read for fun as well as inspiration! Hi Rhonda, My husband just turned 50 and he hasnt been able to work for over 7 years now due to Ankylosing Sponylitis. He has learnt that living frugal makes a big difference. I leave home for work at 7am returning at 6pm so he cooks during the week. We usually use our oven once a week on weekends to bake. During the 80's he raced in the Commonwealth cycle classic Brisbane to Sydney. One of his small pleasures is cycling and its free! I'm sure we both would enjoy the book. I'm not sure if you want to mail the book overseas, but I would love to win it. I'm always looking for inspiration for my simple living journey. I think we all need all the help we can get to resist the messages of our materialistic culture. I would just love love love to win this book! I remember when Greg & Sophie cycled past here and stayed with you. I love the idea of being able to get in touch with yourself - spending the time with your own thoughts as you cycle along. I am one of those people who are in that phase of working life where I spend ~50 hours per week at work, however I'm not working to buy the latest clothes, the best magazines or a new car each year. You can contact me via my blog below, or on sharynned@hotmail.com if I'm lucky enough to win the book!!! Thanks again for the blog you write - it is lovely knowing that other people like yourself and your readers who comment are like minded!!! ps - Gosh I wish there was a "like" button on the comments - there are some great ones here!!! I would love a chance of winning this book-I want to get out of the rat race once and for all. This sounds like a lovely book--I'd love to read it, given away or not :). Just got notification that your book is wending its way to me, which I'm very excited about. IE still is the marketplace chief and a huge part of people will omit your excellent writing due to this problem.